Ontoterminology, defined as a terminology whose conceptual system is a formal ontology, explicits the double dimension of terminology, linguistic and conceptual. It is then possible to build specialized dictionnaries based on these two dimensions. A specialized dictionary entry can be either a term or a concept. Term and concept name, as well as concept definition and term definition, are no more confused. 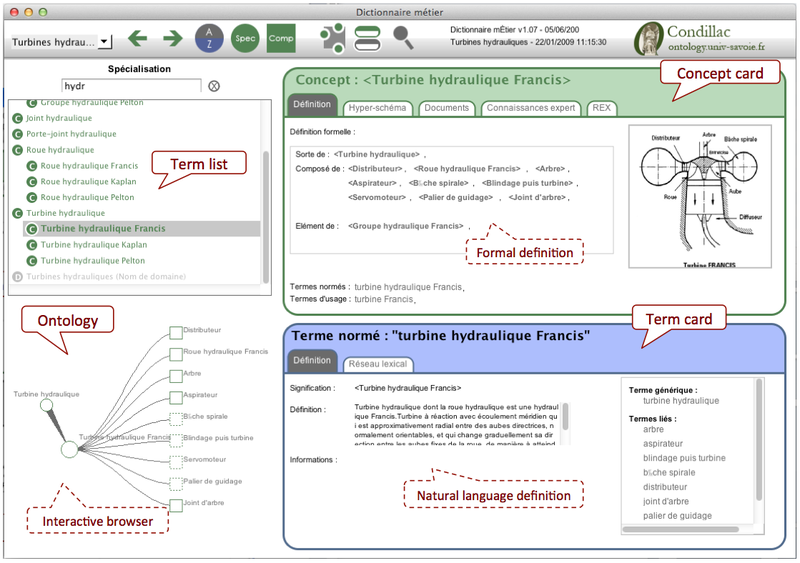 In the following example carried out in the domain of hydraulic dam, the two concept and term cards are displayed in the same interface. Puting forward concept also allows new approaches of specialiszed dictionary browsing like hyperschemas and ontology-oriented navigators.